In Brief: Basically, Sailor Moon can hear when people are in trouble via her "meatballs" which symbolise rabbit ears. Cultural: "Hearing is a rabbit's most vital sense, hence the large upright ears. The auditory system is used to detect predators, as well as to help a rabbit perceive the area around him. Acoustics help to overcome the reduced visual abilities by allowing the rabbit to navigate without difficulty. Sound waves bounce off objects, allowing the rabbit to recognize the arrangement of his surroundings. Most rabbits have large, erect ears. When alert, the ears move forward and backward as they attempt to pinpoint the danger. When the rabbit is relaxed, the ears lie along his back, but they are quite responsive to noise. The slightest sound can be detected from very far away. A rabbit's sense of sound is vastly developed, far more finely tuned than his vision." The Move: Sailor Moon's meatballs turn on automatically due to Molly (or "Naru" in the Japanese version) being in danger. The begin to flash a bright red and Molly's voice can be heard screaming for help. 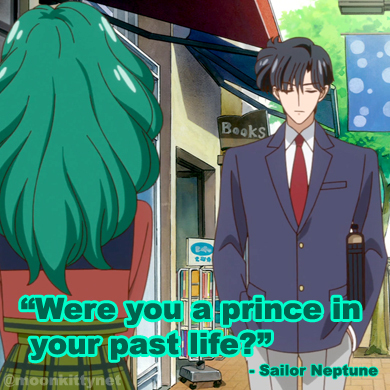 "Which is your favourite Sailor Moon pairing?"